We welcome and appreciate sponsors for our annual gala. Please make checks out to Holy Name School Gala. We ask that you drop off or mail the sponsorship form and payment to Attention Christine Cyr, Holy Name School, 850 Pearee St., Fall River, MA. For questions, please contact Christine Cyr at (774) 526-4064 or the school at (508) 674-9131. Hundred Club: $100 - Name (as written on sponsorship form) will appear on the hundred club member list. 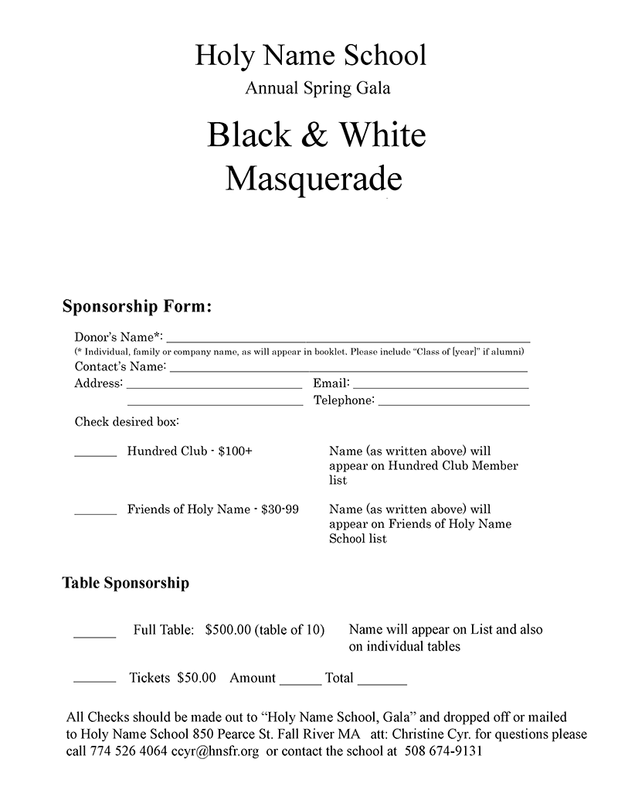 Friends of Holy Name: $30–$99 - Name (as written on sponsorship form) will appear on friends of Holy Name School list. Full Table: $500 (table of 10) - Name will appear on list and on individual tables. Our school’s annual gala is fast approaching us, and the gala committee is reaching out to everyone for donations for our auction. This year, we are asking that students' parents/guardians each donate a scratch ticket or two to our lottery basket. Everyone can send them in with the students or drop them off to the office with the label of attention gala committee. If anyone prefers to drop off a gift card or certificate to the school, we would also appreciate those. We are always looking for items for the auction. Without your help, this fundraiser would not be able to happen. We are looking forward to everyone attending our gala. It is a great night with food, dancing, and lots of entertainment. Please purchase your tickets soon from the school or contact a gala committee person. Please see our gala donation request letter for more information, and thank you for all of your support! Art Night is coming soon and we would love for you to join us! Our night of art is on Thursday, March 21 from 5:30 until 8:00 p.m. Art Night will be at Bishop Connolly High School, 373 Elsbree Street in Fall River, MA 02720. Come see creative and beautiful art work from every student at Holy Name School as well as many other schools in the Diocese of Fall River! There will also be music presentations from each school. Holy Name Middle School String students will be performing at 7:00 p.m. Please feel free to check out our Art Night flyer! Many of you may have already heard or seen on the news a new viral trend called the “Momo Challenge,” which targets children and young adults. Please read our letter for more information about this dangerous challenge. Please join us for the Holy Name School Spring Gala on April 6 from 6:00 p.m. to 12:00 a.m. The night includes dinner, dancing, auctions, and entertainment. Please see below for more information on this special event. 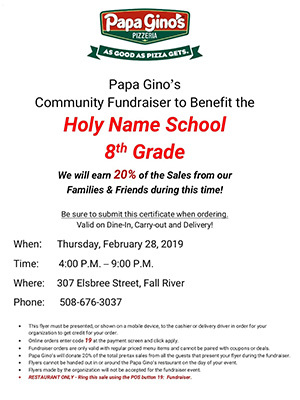 Come join us at Papa Gino's for a community fundraiser on February 28 from 4:00 to 9:00 p.m. Our school will earn 20% of the sales from our family and friends during this time! Please save the dates for our Spring Gala on Saturday, April 6, and the Mother-Son Paw Sox Outing on Saturday, May 4. More information on both these events to come! Special congratulations to our pro-life essay winners: Nathan Kuznar, Veronica Medeiros, and Brendan Resende. We will submit their essays to the diocesan contest as representatives of Holy Name School. We would also like to recognize the other student finalists: Bradyn Domingues, Dakota Garcia, Logan Reis, Taylor Rogers, Savannah Santos, and Sarah Strange. The third upper school dance of the 2018-2019 school year will be on Friday, February 15, from 6:00 to 8:30 p.m. This event is for students in grades 5, 6, 7 and 8. All students should follow the guidelines for birthday dress up day (page 18 of the student/parent handbook). The cost for the dance is $7.00, which will contribute to the cost of the DJ and refreshments. You must return the bottom part of the dance permission flyer with the signature of a parent/guardian, along with the $7.00, by Thursday, February 14. We will not accept permission slips at the dance.